Jews Admitted to Royal Exchange. "Jews' Walk" in the Royal Exchange. A term used to indicate the Jewish merchants who had the right of trading at the Royal Exchange, London. The word "brokers" was first applied to traders, merchants, and middle-men in the time of Edward III. ; but it was not until the resettlement of the Jews in England (1656) that the term was used in connection with the Jews resident in London and doing business there. Much opposition to the Jews was then manifested, especially concerning the privilege of trading as brokers; but the important position occupied by them through their manifold connections in the East and West Indies, made them too powerful to be ignored. At that time wholesale trade was carried on mainly through the Royal Exchange, from which Jews were excluded. This proved so troublesome to the traders that in 1657 Solomon Dormido, a nephew of Manasseh ben Israel, applied for membership in the Exchange. His application was favorably considered by the court of aldermen, who purposely refrained from asking questions and from forcing him to take the oath, because of its doctrinal character. 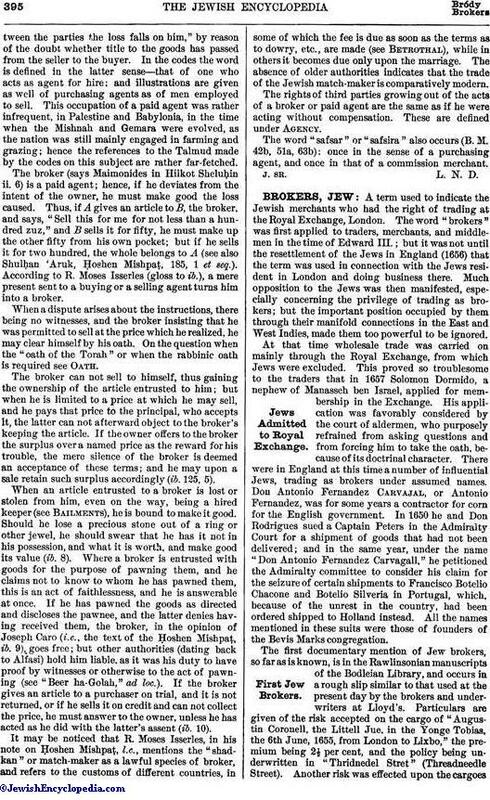 There were in England at this time a number of influential Jews, trading as brokers under assumed names. Don Antonio FernandezCarvajal, or Antonio Fernandez, was for some years a contractor for corn for the English government. In 1650 he and Don Rodrigues sued a Captain Peters in the Admiralty Court for a shipment of goods that had not been delivered; and in the same year, under the name "Don Antonio Fernandez Carvagall," he petitioned the Admiralty committee to consider his claim for the seizure of certain shipments to Francisco Botelio Chacone and Botelio Silveria in Portugal, which, because of the unrest in the country, had been ordered shipped to Holland instead. All the names mentioned in these suits were those of founders of the Bevis Marks congregation. The first documentary mention of Jew brokers, so far as is known, is in the Rawlinsonian manuscripts of the Bodleian Library, and occurs in a rough slip similar to that used at the present day by the brokers and under-writers at Lloyd's. Particulars are given of the risk accepted on the cargo of "Augustin Coronell, the Littell Jue, in the Yonge Tobias, the 6th June, 1655, from London to Lixbo," the premium being 2½ per cent, and the policy being underwritten in "Thridnedel Stret" (Threadneedle Street). Another risk was effected upon the cargoesof the "Dominego Vass and de breto, the 9th May, 1655, from London to Barbadoes in the Jno. Cli. at 3½." Coronel and De Brito (whose names are incorrectly spelled in the premium slip) were also Jews. Probably the first judicial mention of a Jew acting as a bill-broker at the period of the Commonwealth is in the year 1656, when Lady Hall gave evidence before the commissioners of the protectorate respecting a sum of £4,000 lent to Charles Stewart on a bill of exchange. According to the Thurlow state papers, Lady Hall declared "that there is a Jew named Da Costa, a great merchant in London, who hath, and is presently to receive, the sum of £4,000 for the use of Charles Stewart," which sum was to be returned to Da Costa by Mr. Leger of Newcastle. The admission of Solomon Dormido to membership in the Royal Exchange, as mentioned above, led to a suspension of the law excluding Jews; and soon they entered in such numbers that a special space, known as the Jews' Walk, was allotted to them. As the law had been abrogated for the Jews, a similar suspension as regards the taking of the oath had to be generally adopted; and in consequence the Exchange was soon overrun with doubtful characters. Abuses grew so rapidly that public clamor resulted in a reorganization of the Exchange and its laws in 1697. The "Post Boy" of April 27 of that year records that "the Lord Mayor and the Aldermen have been busy this week in receiving petitions from a great number of persons, who put in to be Exchange brokers: they are to be 100 in number, 80 of whom are to be Englishmen and the rest foreigners and Jews, each of whom is to carry a medal in his pocket with his name on it, the King's effigy on one side and the city arms on the other, and they are to show it on the making of any bargains." According to the archives contained in the Guildhall Library, London, the number of Jew brokers or alien brokers was limited to twelve, the election being the prerogative of the lord mayor and the court of aldermen. An entrance-fee of forty shillings was charged, with an annual payment of a similar amount. In addition, the broker had to give surety in two bonds of £500 each, as a guaranty of the faithful performance of his duties. When these conditions had been complied with, the applicant received his medal, which, in the case of a Jew broker, was transferable. The purchase of brokers' medals caused much competition, the usual purchase price ranging from £1,000 to £1,500. In the event of a Jew broker dying before a transfer could be made, the privileges accruing from the sale became perquisites of the lord mayor. The last recorded sale of a broker's medal took place in 1826, when Joseph Barrow Montefiore paid 1,500 guineas to Sir William Maguay, the then lord mayor, for a medal which had lapsed through the death of its owner. 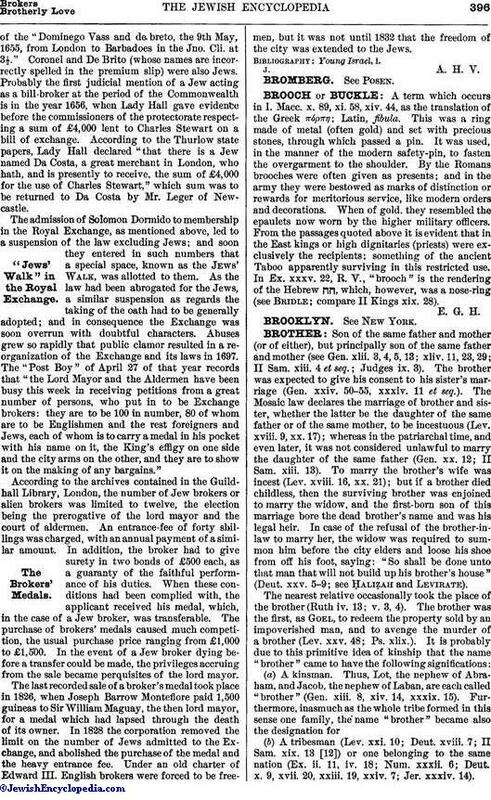 In 1828 the corporation removed the limit on the number of Jews admitted to the Exchange, and abolished the purchase of the medal and the heavy entrance fee. Under an old charter of Edward III. English brokers were forced to be freemen, but it was not until 1832 that the freedom of the city was extended to the Jews.